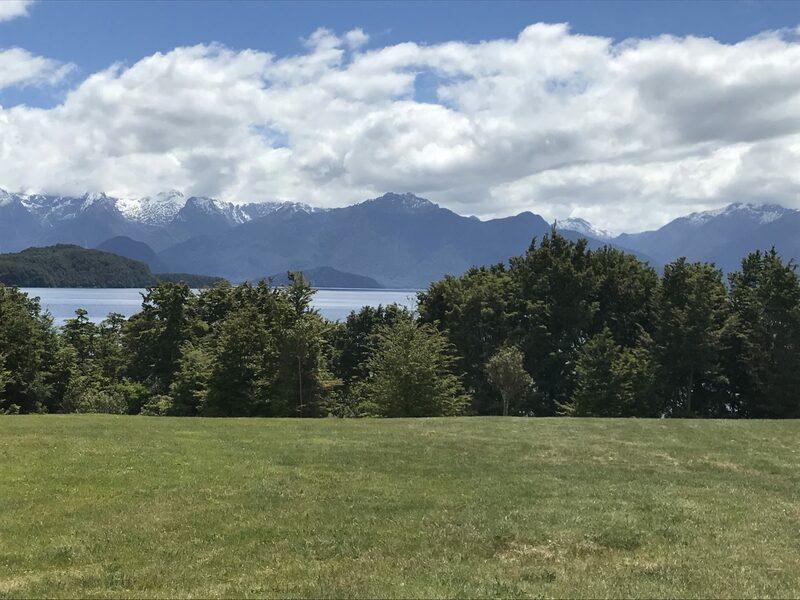 With the Fiordland renowned for its natural beauty, we knew we needed to find time to spend at least one night in the area. 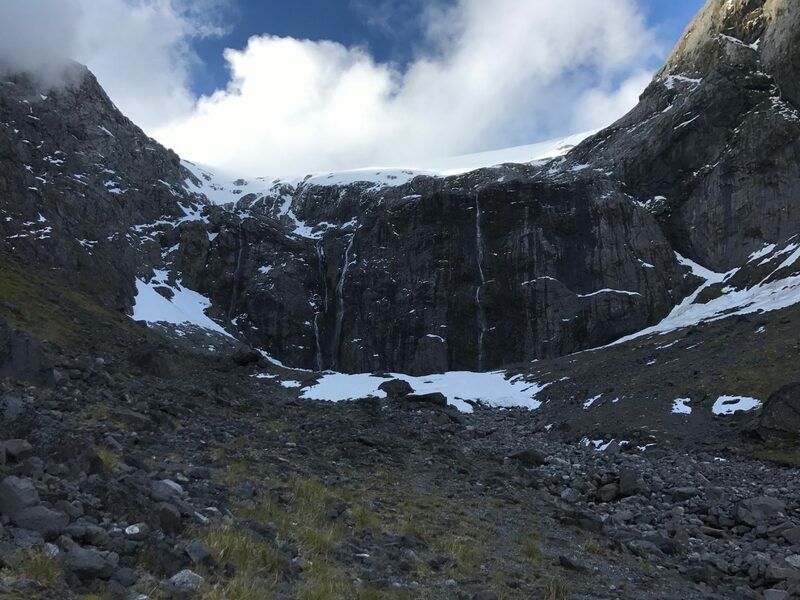 Darren wanted to goto Milford Sounds and had looked for accommodation in the area struggled to find anything closer than in Manopauri. 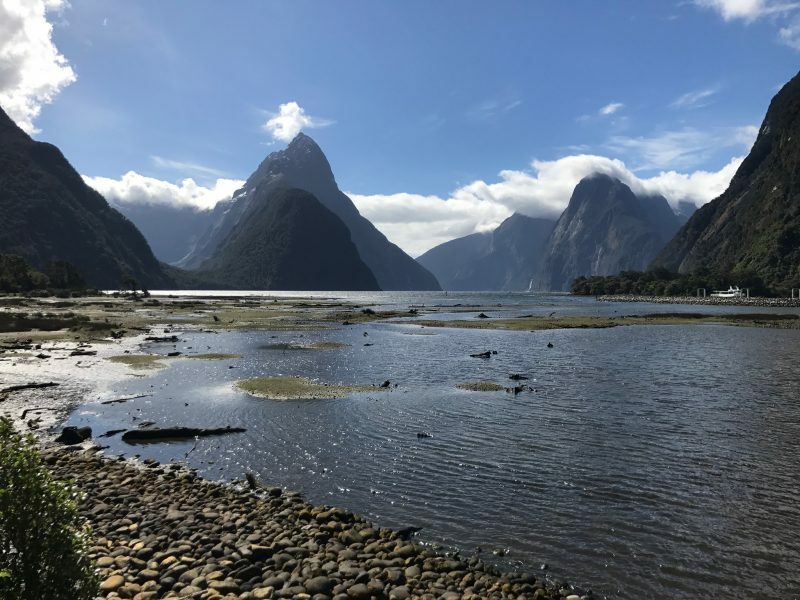 As we now know there is actually very little accommodation in Milford Sounds, so apart from the few places in Te Anau which were also fully booked we couldn’t have any closer anyway. Our plan was to go to Milford Sounds the following day, but after checking out of our horrid B&B in Dunedin super early we found we had time to go. I was so glad. Milford Sounds is AMAZING! After dropping our bags at our lovely airbnb, we head straight out to explore Manopauri Lake which was just a few moments walk away. There was nobody else around and the lake was so beautiful and so peaceful. I could have stayed here all day if it wasn’t for the hundreds of flies which were intent on biting us. After putting up with it as long as possible we jumped in the car and went for a drive. 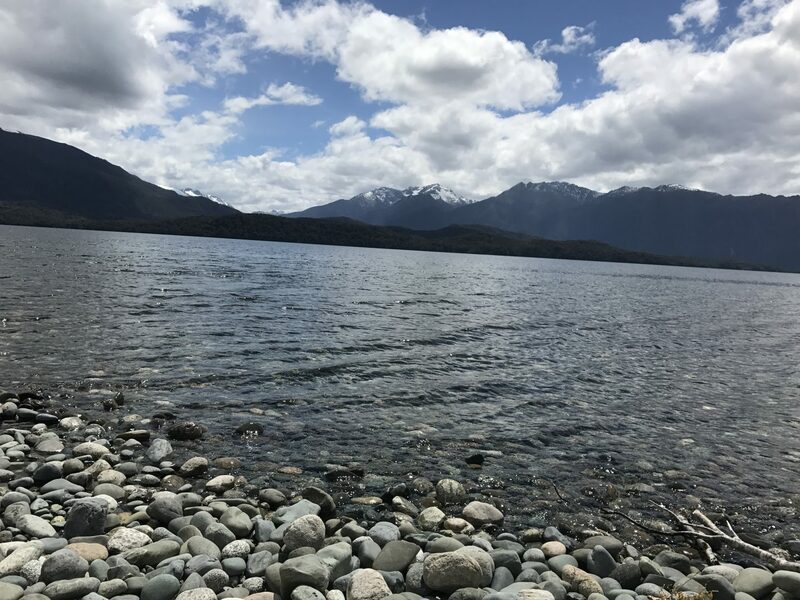 We actually didn’t really know where we were headed but we ended up at Te Anau lake. As we sat by yet another peaceful lake, we tried to decide what to do with the day. It was not even 3pm and although we planned to have a picnic at Manopauri the hoards of flies changed our mind. Milford Sounds was only a couple of hours away so we figured we could head down (or up) for an ice cream and a walk. To give Darren a break from the hours he spent behind the wheel I decided to have a go at the driving. I had tried driving the automatic hire car once before on our journey to Fairlie but forgot myself, went for the clutch to change gear, hit the brakes and came to a complete stop. I frightened myself to death and vowed never to drive an auto again, but Darren gave me a quick lesson and this time I cracked the peddles. After a practice along Te Anau I was good to go. 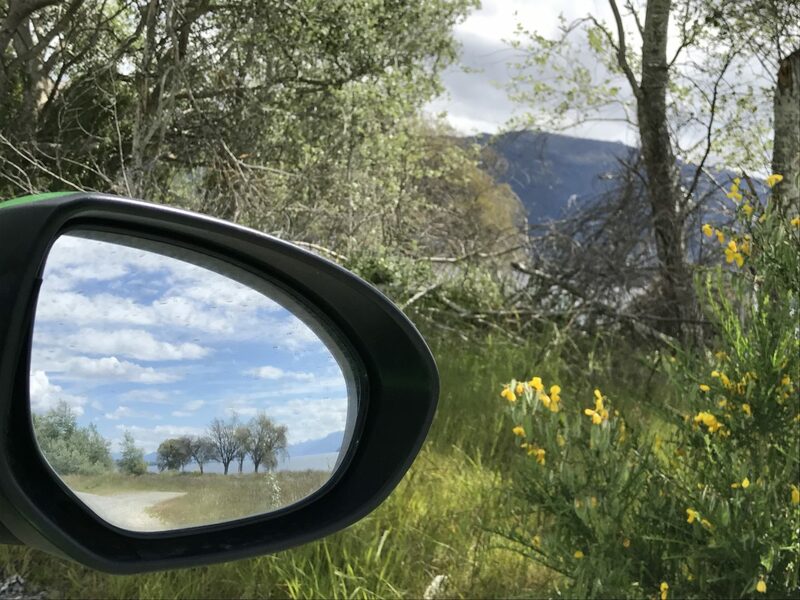 This was the view in my mirror. Pretty huh?! The drive along SH94 is beautiful. It’s difficult to speed due to the twists in the road. Even if it was a straight path you’d struggle to get to Milford Sounds in much less than two hours. Drivers tend to go slow taking it all in (too slow some of them). We stopped at mirror lakes but wanted to push on so decided to do our stopping on the return journey. (As you can probably guess, we never really had time to do that when we left either). 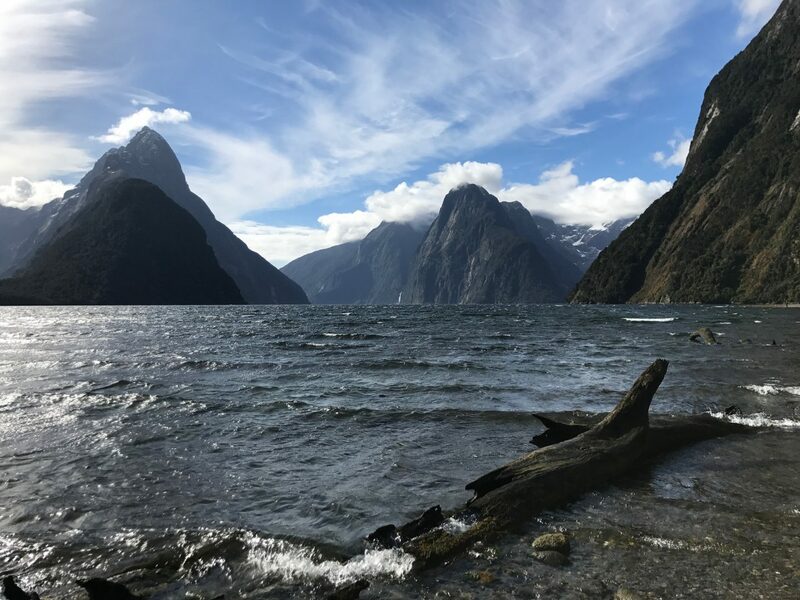 It took us over 2 hours to get to Milford Sounds so it was just coming up to 5pm by the time we arrived. 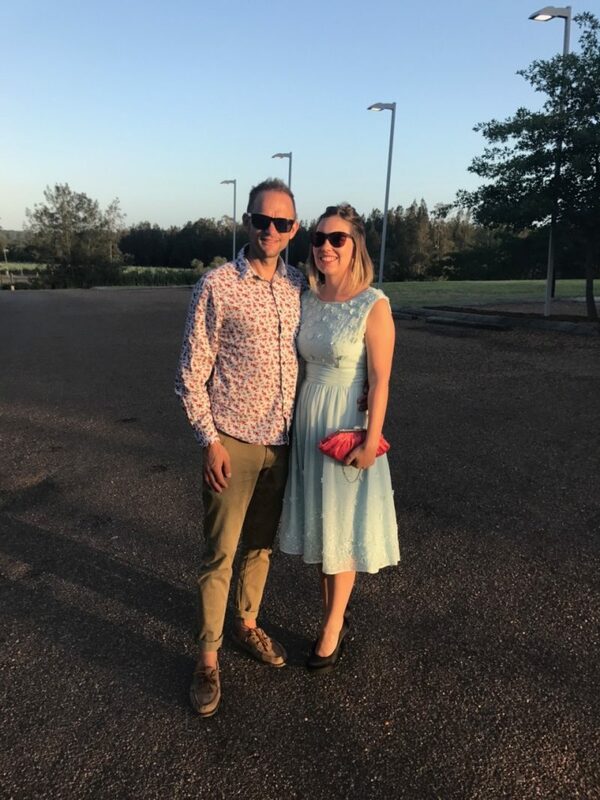 We had passed a lot of cars coming in the opposite direction and we were pretty chuffed that of our hunch that people were on their way home was correct. There was barely a soul in Milford Sounds! Our breath was taken away. Nobody else was here, and we had time to take in this incredible place on our own. Of course it wasn’t long before a big group arrived, but we did have a good quarter-hour by ourselves. We knew we had a long journey back and would be hitting nightfall so reluctantly got back in the car having only scratched the surface of Milford Sounds. Although in an area renowned for walking we knew we had to make at least a small hike. We walked to the first snowfall in this picture. It was an hour-long return walk (come climb) so at least our legs got some exercise after a long day of driving. 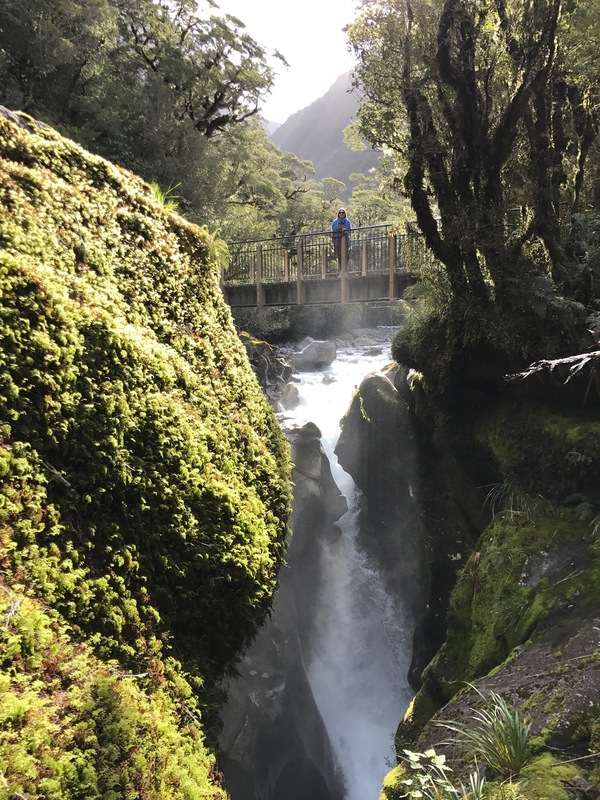 Milford Sounds is the wettest place in New Zealand and in fact in the world. 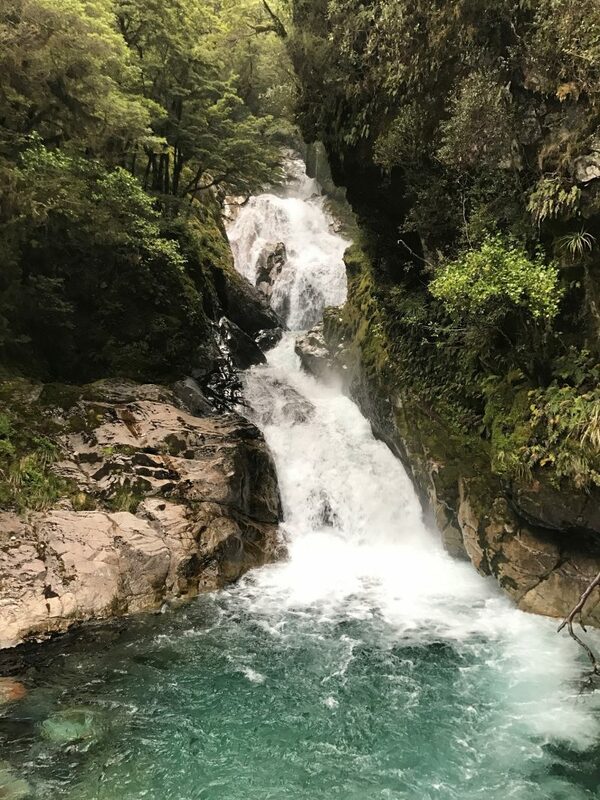 On the way back to Manopauri we stopped at the Chasm for another short walk and very briefly at one of the other many waterfalls along the SH94. We collected some water for the return journey and made a wow to return again some day soon. There are so many things I want to come back and do. I really home we’re back soon! I want to spend days hiking, kayaking, enjoying a boat trip and taking a helicopter ride. Perhaps we can save up enough for the Milford Sound Overnight Cruise – Fiordland Discovery. * How amazing does this look!